Egypt is a country in transition. The recent revolution has left the infrastructure in disarray. The first thing you notice is the trash. The previous waste management company was fired and the new one seems to be still negotiating terms, while the city of Alexandria is drowning in a sea of trash. Looks like the perfect recipe for a plague. Add to that the economic depression and you observe that virtually all new construction was abandoned for financial or tax reasons. There are so many vacant building the city looks more like a Third World country and many areas look like a war zone. What a shame for a country with such a long and honored history. It was sad to see. 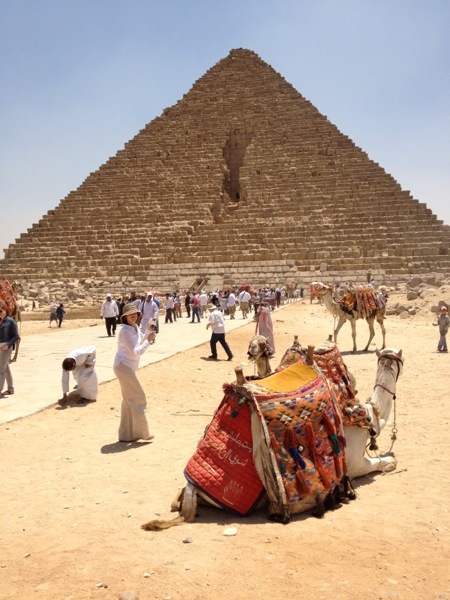 In twelve hours we traveled from Alexandria to the Pyramids and the Sphinx, then to the Egyptian Museum in Cairo. Tourism is a leading industry and last year they had almost none. Though it has returned some this year (post-revolution) it is still significantly reduced. I see no reason for that to change, unless there is significant change internally. There is a level of desperation existing just below the surface that shows itself at times and could lead to significant chaos. Though the leadership and intellectuals try to suppress it with rhetoric like "Muslims + Christians equal Egypt" or future hope. With locals rejecting the low-grade fuel forced on them, the infrastructure in disarray, and an uncertain economic future, I am discouraged about the country's prospects and would not return. The pyramids were impressive as you neared them. Surprisingly they are adjacent to town. The vendors are the most aggressive, rude, and persistent I have encountered anywhere. Most of which I attribute to the above circumstances. The Egyptian Museum is in such disrepair and lack of maintanence that they decided to relocate it to a new facility somewhere rather than attempt to restore. I preferred the British Museum or the traveling exhibit, which is a shame for it was once one of the great museums of the world. What I thought would be a highlight of this trip, may be its greatest disappointment. Cynthia Whitcomb, screenwriter and playwright, who is teaching our writing group during the cruise, checked off "ride a camel" from her bucket list.